Love is in the air and you probably want to celebrate with a lavish Valentine’s Day meal. But if you're looking for something a little different, there are plenty of delicious options to spice things up a little. The restaurant, located at the restored The Capitol Kempinski Hotel Singapore oozes romantic vibes. In fact, the site was famous in the 1960s as an entertainment destination, particularly with couples on their first date. It helps that Capitol Theatre is still part of the attractions in the area and very likely the reason why chef-owner Alvin Leung has crafted the Dinner & A Movie menu. The meal begins with the "three-style corn salad", where Leung serves popcorn jazzed up with heirloom tomatoes, cucumbers and a good drizzle of Pat Chun sweet vinegar. The meal gets better from here, with a grilled whole Boston lobster slathered with a housemade tropical mangosteen sauce served next. Dessert is an elevated and more tropical rendition of the ice kachang, featuring mango pomelo sago garnished with shaved coconut ice, pomelo bits, sago, and yuzu. Head chef Sabrina Stillhart firmly believes that the way to your partner’s heart is through the stomach. That’s why she has prepared a four-course menu that begins with a light and zingy serving of Irish oyster with chives and soy-ginger dressing, as well as a king crab and salmon ceviche with crusted avocado, chilli and coriander. For something extra special, she has also brought back Gordon Ramsay’s signature beef fillet Wellington (to be shared). The meal winds down with a strawberry cheesecake tart finished with rhubarb glaze. As an additional treat, you’ll also get complimentary petit treats (from hazelnut pralines to rose-flavoured marshmallows) and a digestif in the form of a His and Her Kiss cocktail. The charm of this modern izakaya is its laidback style, which makes for a perfect Valentine’s Day spot when you’re just getting to know your date. Dishes are made for sharing, so both of you can tuck into delicious signatures that include the Tokyo Hummus, made with edamame (instead of chickpeas) and a sprinkle of chilli for a bit of heat, and it’s served with moreish curry chips. The portions are just right but you can order more to share. 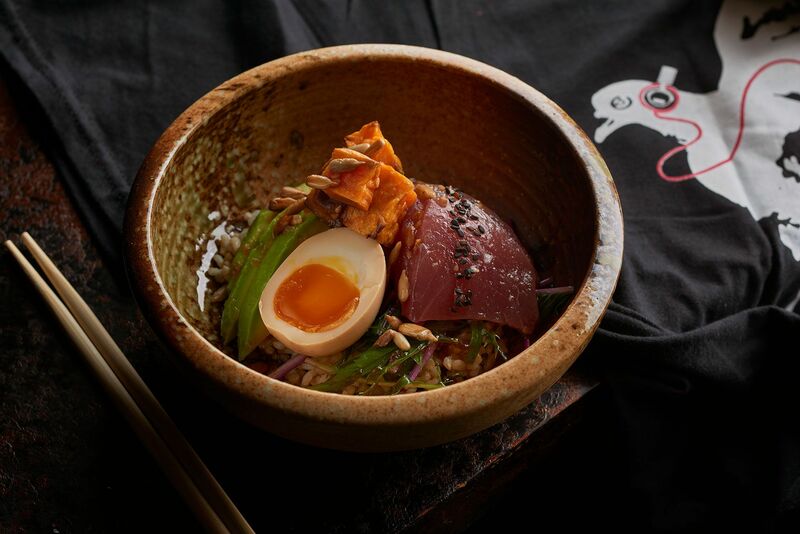 The tuna sashimi donburi is a bowl of brown rice, sunflower seeds, sweet potato, and oozy onsen egg, while the grilled barramundi comes garnished with mentaiko, parsnip and rosella compote. Don’t forget to order the Peary Love, too, an exclusive Valentine’s Day cocktail comprising Colombo gin, karakuchi sake umeshu, peach orgeat, Poire Williams, sesame oil, fresh nashi pear, and lemon juice. Leave it to executive chef Sebastien Donati to prepare an aptly elegant menu. A surprise starter is the foie gras terrine, featuring an ensemble of smooth duck liver, nuts and dry fruits. It's followed by a heart-warming cauliflower and parmesan soup generously topped with shaved black truffles for a deep earthy finish. For the mains, capellini cooked in a luscious cream sauce is served with a dollop of Italian Baeri caviar, followed by the filetto di vitello on a bed of creamy polenta and morel mushrooms. Dessert is a not-to-be-missed ispahan, in the form of a gigantic macaron decorated with rose cream, lychee and yoghurt ice cream. If grilled meats are what you are hankering for, the seven-course Valentine’s Day menu might be something you'd want to consider. Chef Ryohei Kenyoshi has a spring lamb chop expertly prepared over binchotan, as well the Black Angus beef tomahawk or 1kg Ocean Beef OP bone-in rib eye cooked to medium rare, that's perfect for two. The other thing good about this menu is that it’s balanced with seafood options, so you’ll also enjoy the likes of octopus and green plum; Japanese hard clam with gazpacho; tuna tartare with Japanese leek; and chargrilled eel with foie gras. This week isn’t all about Valentine’s Day. The Italian stalwart has debuted a sumptuous set lunch, available until February 22. The three-course meal has tons of delicious options and there are four starters to choose from, but we’re zeroing in on the delightful chilled sea prawn cocktail and pan-fried foie gras paired with green tomato relish and caramelised onions. What about mains? You can’t go wrong with the farfalle pasta coated in a luscious four cheese sauce; succulent roasted pork belly decorated with sautéed spinach and apple bits; or grilled barramundi fillet doused in a zesty lemon chilli sauce. Desserts here really need a separate stomach, but the standout for us is always the smooth and silky pannacotta drenched in a decadent strawberry sauce. We're looking forward to Saturday for one reason—Cé La Vi’s Sky High Brunch. Like all the previous editions, there’s much to drink and savour. Executive chef Joey Sergentakis takes care of the latter with contemporary Asian fare including the wagyu beef sliders and crispy chicken sliders lathered with chilli aioli, lettuce and mayo. These are, of course, complemented with bottomless drinks spanning Veuve Clicquot champagne and cocktails, of which are faves are the Aperol Spritz, which is perfect for our hot and humid weather, and the Pimm’s Summer Cup.